The Maitri Project is complete! The students returned home on April 7th. Check back periodically for a couple final posts as well as a full 20 minute overview video in a week or two. Today my peers and I visited a local school called Step by Step. 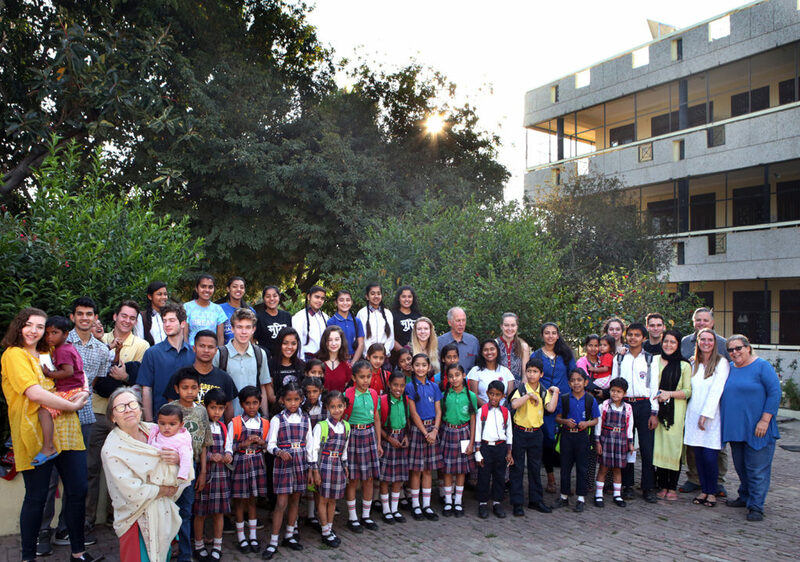 It is one of the most prestigious schools in India and most of the students are from wealthier families. It was interesting to see a school like this, after seeing so much poverty. I had not realized that there are such massive economic differences here, and just how close they are to one another. Before our visit, I thought that the kids at Step by Step would be stuck up, so I was hesitant to go. I was also not looking forward to an eight-hour day, talking with strangers. But we went, and I have to say that I had an amazing time. The kids were authentic and vulnerable with us, during the discussions we had. We talked mainly about the education system and the flaws in it. Talking with these students really opened my eyes to the pressure most kids in India face regarding school. They grow up with immense expectations from society, their parents, and themselves. They explained they have little time for themselves, and zero time for a social life. One student explained that they must choose between social and academic, and how the two in congruence cannot exist. I found this very unsettling. It killed me hearing them talk about how their world revolves around school, and more importantly grades. They learn to pass tests, not to find meaning. This is something that I have realized Mount Madonna has done a great job cultivating; finding the importance in what we learn. We can think more freely, and arrive at different answers without one being right or wrong. This trip has made me grateful for the education system we have, and I genuinely feel guilty for complaining about it so much. I am really going to take away the value of education that these kids hold because it is truly inspiring. 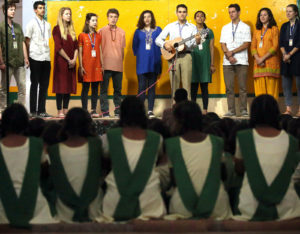 Whether it is at this prestigious institution or at a rural girl’s school, they all are united in their gratitude, and THAT is truly amazing. Today we went to a Indian school to “lead” a Samvaad, or dialogue, on important questions of the time. 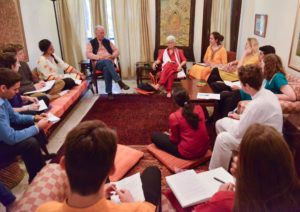 There are a lot of people in India, and this makes college admissions very competitive. They are determined solely by a board exam (SAT on steroids). The primary purpose of school is to prep students for this exam. Thus, the students were completely unprepared for our version of a standard values class. We began in small groups: by writing and sharing the deepest questions plaguing our minds. The interconnection between these was especially interesting. Even in a group of three, one of the people in my group had, effectively, the same question as me. During our reflections, the other students shared that they were amazed by the effects listening with curiosity can have on dialogue. Their enthusiasm made our conversations fun and meaningful. It was especially encouraging to see their excitement at trying something so new, and productive, that they are rarely exposed to in India. 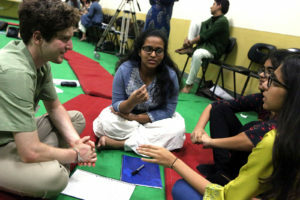 The conversations also had an unexpected effect on the students: it made them more open and friendly. The trust and familiarity that they felt with us, after just hours, is something that is rarely found in US. The entire experience reinforced what we have already learned about the power of dialogue. After an incredibly bumpy 7-hour bus ride, we arrived in Anupshahr. We were coming off a long night of dancing and partying in honor of our last day at the ashram. Almost all of us were feeling tired and disoriented, traveling from place to place really took it out of us. I had no idea what to expect from our next experience at the Pardada Pardadi school for girls. The only thing I knew was that it was a huge establishment, providing education to about 1400 girls who came from the surrounding rural villages. Upon arrival, we were very kindly greeted by a group of students who had just finished their grade 10 exams; I immediately became energized by this bright group of students who were eager to show us around. Right off the bat, I became friends with two girls named Bhati and Swati. They guided me through their huge school and along the way we interacted with dozens of younger kids who were playing outside for recess. We shared with each other a bit about our interests and our passions; I learned that both girls were studying maths and science so that they can become software engineers. They also shared with me that they loved to play music and dance. Most of the girls who go to Pardada Pardadi are first generation learners, and through this institution they’ve had the incredible opportunity to receive a quality education so they can pursue their dreams. The girls spoke amazingly good English. They were kind and respectful, eager to learn, and they were great listeners. After spending an hour with them it was becoming very clear to me that there was something special about this place. One of the greatest lessons I’ve been learning over the course of our trip has to do with service. We have met incredible leaders, who have dedicated their lives to serving a cause much greater than themselves. This has inspired a life changing and new outlook on life, and a greater understanding of what I seek to value. 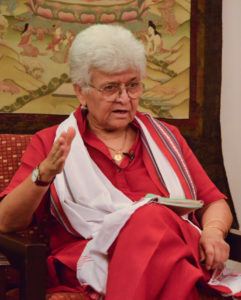 During our time in India, we have met with Rinchen Khando, who has devoted her life to helping establishing, and running, The Tibetan Nuns Project. We have met with Dr. Metre who runs an organization called CORD, that helps empower women in rural communities. And of course, we have had the great privilege of meeting with His Holiness the Dalai Lama, who has been a huge proponent of secular ethics and non-violence. Here in Anupshahr, we have met yet another great leader, Sam Singh. He is the founder of Pardada Pardadi and former vice-president of U.S. South Asia DuPont. He worked hard his whole life so that he could give back to the community where his family has owned land for over 140 years. Sam is a visionary who decided he would dedicate himself toward improving the lives of thousands of young women in need. He is an incredible problem solver, and his ability to implement the organizational strategies learned in the corporate world has allowed him to overcome some of the greatest boundaries. Last night, we got to have dinner at Sam’s house. We drove until we arrived on his beautiful property, out in the country, and for the first time on this trip we were able to enjoy a view of the stars. We ate a gigantic feast, outside on the rooftop level of his home. Dining with us, was a group of people from the United States who were visiting as part of a medical project. They had just finished vaccinating the whole school for typhoid. 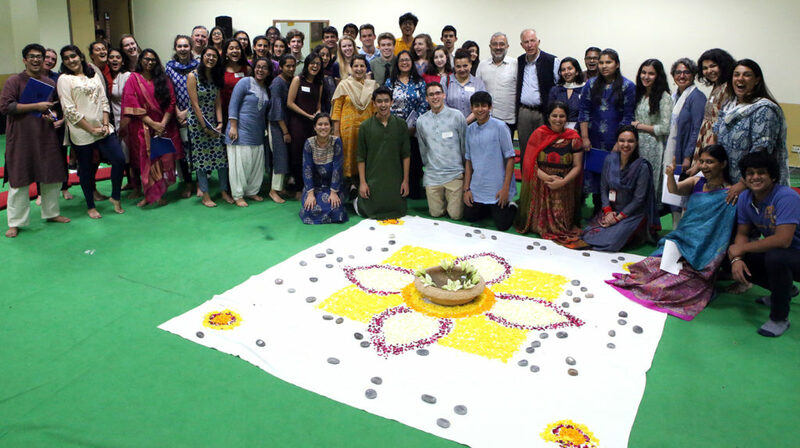 Our teacher, Sadanand, shared with us the significance of this project. He explained that when you dedicate your efforts toward improving the lives of others, often times you’ll attract people with special expertise who will be willing to contribute. I find it inspiring and uplifting to know that when we truly commit our hearts to selfless service, we can establish meaningful relationships, and therefor have access to great resources we can use to accomplish our goals. After our bus ride from Sri Ram Ashram to Pardada Pardadi, we were all pretty exhausted, and hungry. I almost didn’t feel like I was ready to meet the school girls. However, as we pulled up we noticed that there was about twenty girls waiting at the entrance of the school to greet us with scarves; so really, there was no avoiding it. 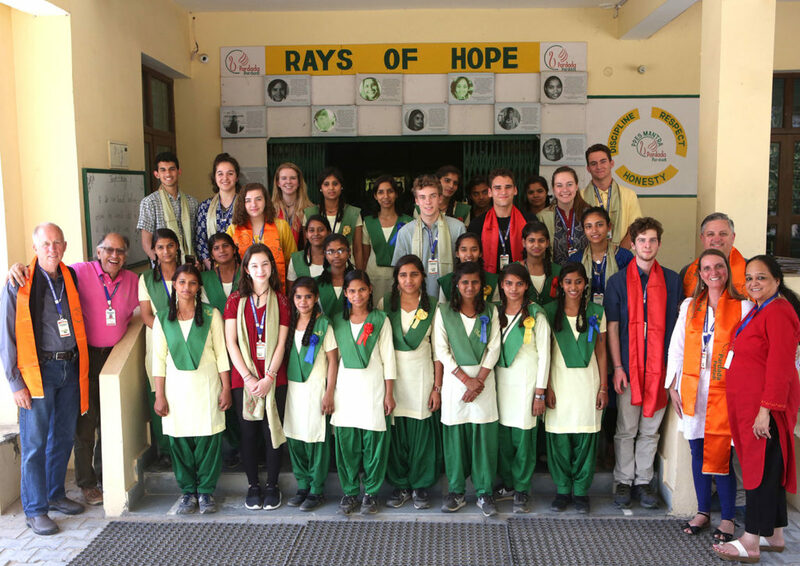 My class and I stood in a straight line across from them as they came forward and placed scarves around our necks. I thought it was a very kind greeting. The first girl who I made eye contact with was a very short girl with long hair, and a pretty smile. Her name was Nahid. She ended up being one of my guides along with another sweet girl named Sobha. A few times I was told how happy I looked, and many times I was asked what I was thinking, and why I was smiling so much. The tour didn’t last long, as the girls were soon out of school. Nahid and Sobha wrote their names on my palm in pen, so I wouldn’t forget. They told me how much they would miss me, and that they would be thinking of me until we saw each other again tomorrow. We hugged goodbye and off they went with a few other of their friends that they had previously introduced me to. 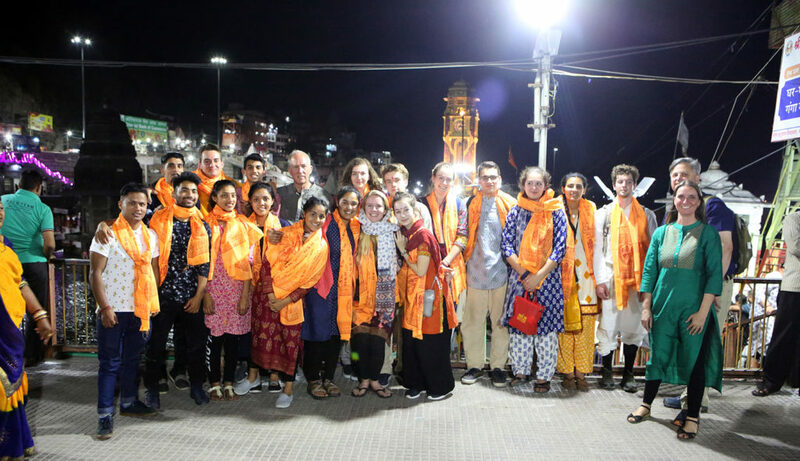 Later that night, we had the opportunity to visit the founder of the school, Sam Singh, who explained to us that his home and the property where the school is had been in his family for many generations. Sadanand pointed out the very amazing fact that Sam and Renuka, who helped him create the school, managed to always find a solution to the issues faced by the families in the village, and their daughters. For example, it is promised that if the girls have a 70% attendance rate at the end of each year, 10 rupees will be placed into an account for each day, and at the end of their time studying there, the money is theirs for their future. There is a solar lamp checkout system for girls who don’t have electricity at home, so that they can study at night. There were many other clever solutions to the problems faced by the girls. Nahid and Sobha are by far two of the most amazing girls I’ve ever met. Even though we live on opposite sides of the planet and were only able to be with each other for a very short period of time, I know that I’ll remember them. They had a strong impact on my views about the need to empower and support girls. They are, after all, two of the most passionate ones I’ve ever met. Click a photo to enter slideshow mode. Photos by Shmuel Thaler. Click a photo to enter slideshow mode! Photos by Shmuel Thaler. See post below for student reflections. After three beautiful, fun-filled, relaxing days at Sri Ram Ashram, sadly it was time to leave. However, in true Sri Ram Ashram style, there was no leaving without first having a party! They take their parties seriously; they have a permanent outdoor stage, lights, microphones, loud music, dinner, and ice cream! The kids, of all ages, performed choreographed dances for us. They blew me away. The amazing thing about music and dance is that it always seems to bring people together. Joy took the wheel when we danced together, and love radiated through our songs. 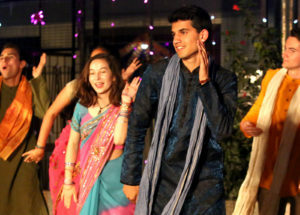 We performed a Bollywood dance that the kids taught us. We ended up performing two encores because the crowd kept cheering us on. When we started the last encore, they all came up and danced with us. I picked up a little girl named Ambika; she was quiet and shy at first but then her sweet heart and sassy attitude poked through, and I ended up dancing with her in my arms for the rest of the night. Ambika was abandoned as a baby; when she was found, her condition was critical and life-threatening. But this little girl, and every single kid on that stage with us, despite the horrific things they’ve been through, chose to dance, laugh, enjoy life, and show my class and me unconditional love. I looked at Ambika, smiling with her hands up, bouncing in my arms, and enjoying the music. Watching her, I had so much gratitude toward Sri Ram Ashram for giving this precious girl and all these amazing children a chance at life, a home, and most importantly, a place where love, playing, and partying comes first. Last night I experienced one of the greatest parties of my life. When SN told us that the Sri Ram Ashram kids knew how to party, I never imagined their parties would be so legendary. 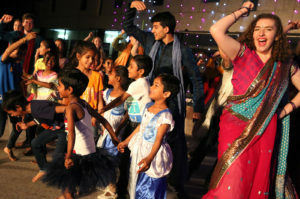 The night started off with some of the smaller children performing a Bollywood dance. I noticed how invested they were in the dances and how talented they were. Half way through the performances, our class was called up to perform two songs we had been practicing. The first song was a Hindu song called Danava Bhanjana. We chose this song as a way to connect to the Hindu culture, and the people at the ashram. The other song was a reggae song called One Day which had a positive message about stopping hate and war around the world. Personally, I was nervous about the Hindu song and I really wanted the people at the ashram to enjoy it. After finishing the songs and walking down from the stage, we were greeted with smiling faces and shouts of, “good job” from all the children and adults. Their responses brought me a sense of relief. After a couple more wonderful dances from the ashram kids, it was again our turn to share our talents; this time we would be dancing. Since our arrival at the ashram, I had found a new passion for dancing. Each day, we had dance practice with the ashram children. They taught us a Bollywood style dance. We worked very hard to learn the dance and I was thrilled to get the chance to perform it for them. As soon as the dance begun, I looked down to see if the children were enjoying it and all I could see were wide smiles. This gave me a burst of energy and I was inspired to give my absolute best for these children. When we finished, the crowd began to cheer “Once more,” repeatedly, until we finally agreed to perform again. The same cycle repeated after we finished the dance and again we were forced to dance our hearts out, but the third performance was different. When we reached the middle of the song, everyone ran up on stage and began dancing with us. The warmth this brought to my heart was overwhelming. All I wanted to do was enjoy each moment with these wonderful kids. Sri Ram Ashram holds something very special in the core of its establishment and inside all its people. Getting the opportunity to spend a few days there, in all its wonderment, was amazing and filled me with joy. The kids there were kind and compassionate towards us from the second we arrived. They wanted to know all about us, and invited us to play with them, constantly. They brought out the inner child in all of us, and that was a wonderful thing to witness. It allowed the group to just let go, be free, and have fun. I learned so much from the kids at Sri Ram Ashram. They were extremely talented and passionate, and they are bold in being their authentic selves. That is something I don’t usually get to see, and I found it very inspiring. We connected with all of them so easily, either through play, dancing, our meals together, or on the fun adventures we went on during our stay. In the Hindu faith, there is an Aarti ritual, in which light is offered to the deities. Each morning and evening, the whole community fills a prayer room and participates in this daily ritual of singing, praying, and music. We were encouraged to join them each night; the kids would join up with all of us and help us sing the songs, and explain the ceremony. 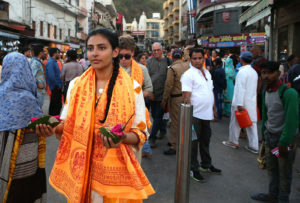 I was struck by how devoted these children are to the Hindu faith, and how their dedication allows for compassion and connection among themselves, as well as people outside their community. 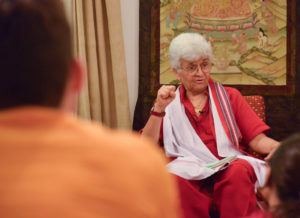 During these few days, I really got to see firsthand the impact that Babi Hari Dass has had across the world. I have grown up around the Mount Madonna community, and I experienced and witnessed what he has done for us in the United States. 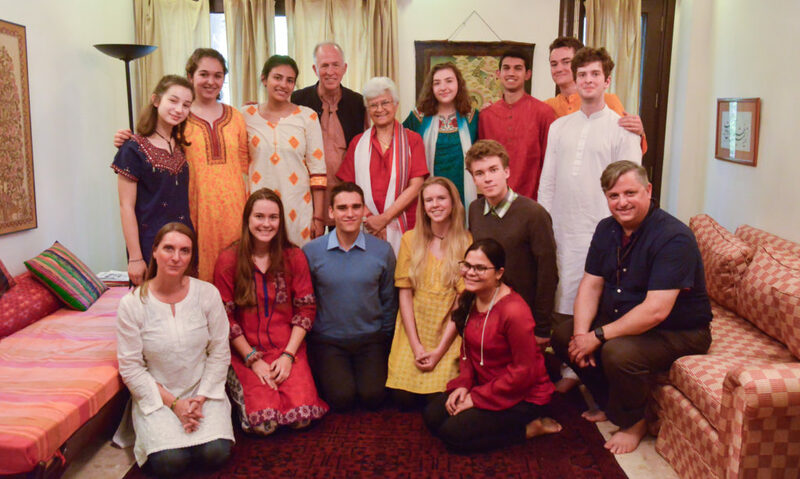 However, to see his impact on the Sri Ram Ashram community was different, and exceptional. 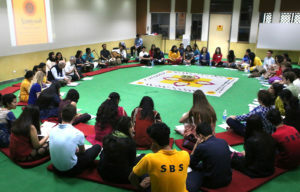 The spirit of Babaji absolutely lives on in each one of these children; their respectful and compassionate nature, their sharp and unique characters, and their love for play, all thrive at the core. I was able to find a new appreciation for Baba Hari Dass and for the countless opportunities he has provided for kids all around the world. I appreciate how he has inspired so many individuals, and helped shape several communities. Our last night at the ashram was one of the happiest moments of my life. I learned that no one parties harder than the Sri Ram Ashram kids.